Time to “Leap” into a new design – Giveaway too! After working for quite some time JL, my hubby and handy dandy webmaster, finished my new blog design enough to make it live last night. Did you check it out? Please head on over to look and see what you think. There are still a few little bitty things that I would like different (mainly the header), but it is nice change of scenery. You may have also noticed that I now have BlogHer ads. I wanted to try them to see how it went. I have always admired all of the blogs out there with them and have learned about several from looking around the BlogHer site itself. One of these days I will get to the BlogHer convention (oh please come to the East Coast one of these years). If you notice any bugs with my new blog layout please let me know. Leave a comment here or e-mail me. The information for that is in the About Moi section.Now onto the giveaway information. A few weeks ago I was contacted by someone to run a giveaway on my blog – so readers check out the details below. I asked if it would be acceptable with them to wait and do it with this launch . . . she agreed. In fact she also increased the goody being given away last night! Here is the information. Announcements Galore would like one of my readers to win a $30 gift certificate to their website. 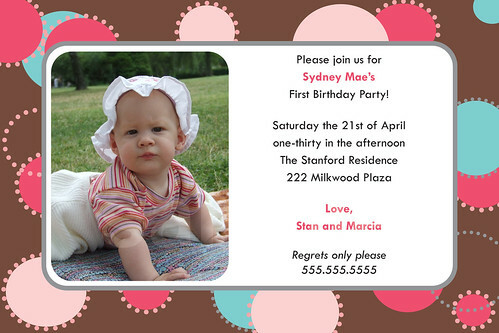 If you have a special event coming up, need to make photo greetings, or announce a wedding or new baby, then this is perfect for you (there are many other possibilities too). Head on over to Announcements Galore to see what they have to offer. Cute no?!?! There are so many possibilities it can make your head spin. If you would like a chance to win all you need to do it head over to the Announcements Galore website and look at what they have to offer. Then head back here and leave me a comment letting me know what your favorite(s) are. What will you do with the $30 when you win it. . . think positive! Don’t worry you can always change your mind later on. For one entry all you need to do is leave a comment here telling me how you would use your $30 prize at Announcements Galore. For a second chance you can blog about this giveaway and link back to me. Just let me know so I can give you the extra credit entry. Entries will be accepted until 10:00 PM EST on Thursday, March 6, 2008. I will announce the winner here during the day on Friday, March 7, 2008. Oh, and for those of you who want to purchase something now (or later) from Announcements Galore please know they gave me a cool coupon code for 10% off –> SPRING10. Just let them know TheAngelForever sent you. P.S. Thanks to JL for being the best webmaster (and of course hubby) a girl could ask for! *** UPDATE: It is officially after 10:00 EST on Thursday, March 6, 2008. The comments are now closed. Thank you to everyone that entered and to Announcements Galore for sponsoring this fun. I will post a winner tomorrow. Stay tuned more giveaways in the future. « They stayed in their room – ALL night! Very nice site! I love the cards and would use them for my son’s birthday coming up in April. I would use it for Christmas cards. I like the Easter cards! Very pretty. My daughter is graduating from high school in June. I love the black and white graduation announcements. I would probably get the holiday cards. They’re all pretty nice. I absolutely love the christmas cards. The store bought ones are getting old. I love the personalized Christmas Cards. It would give my family a chance to see the children and how much they have grown in recent years. My favorite is the Valentine’s Engagement Announcement. I think that since we haven’t sent Christmas cards in a couple of years, I would pick the Christmas Circles and Dots…and make sure to pick the cutest picture to use. Thanks! Need baby announcements real soon.